Home intrusions can happen in a moments notice and catch even the well prepared off guard. While it may be nice to have a Mossberg shotgun in every room for self defense, it is not the most practical plan. Being able to defend yourself quickly could turn the tides in a bad situation. An improvised weapon could make the difference, allowing you and your family to escape or defend yourselves. You may have different goals for what you are trying to achieve with your makeshift weapon based on the intruder and their motive. The best improvised weapons will keep the attacker out of reach, are intimidating, and are durable. We spend a good amount of time in our bedrooms, and many home intrusions occur at night. While it is best to have a more formidable weapon for your bedroom safe haven, here are a few unorthodox options. A curtain rod has the reach and versatility to be annoying in the least and incapacitating at best. Using the rod as a spear to keep an attacker at bay is ideal. Avoid slashing with the rod in favor of timed thrusts. Aim for the face, neck, and groin if time allows, but aiming center mass may be the best option in an unpredictable situation. Bedrooms are usually large enough for a curtain rod to not bump against walls and cause problems, but it’s usefulness drops off quickly when you move to smaller rooms or around corners. A lamp can be a Swiss army knife of personal defense. Remove the shade and throw it at the attacker. It is largely useless and the best use for it is to disorient and show the attacker you mean business. Using the lamp as a club is very effective when you hold the neck and attack with the base. The bulb orientation on your lamps and the lamp height may make attacking with the bulb side useful as well. The cord could also be used to tie or choke intruders, but do not let it get in the way or be used against you. A myriad of weapons can be found in the kitchen. If you can cook with it, you can probably use it for self defense. An intruder could easily find themselves in trouble if they are confronting you in the kitchen, since you may already be holding one of these tools. There are plenty of knives in most kitchens, and knives in a block are the largest and easiest to get a hold of. Even untrained people can be extremely dangerous with knives, and holding one will cause most attackers to think twice. A broom or mop has plenty of reach to keep an attacker at bay. You can grab the handle, press the broom into the floor, and stomp right above where the bristles connect to break the broomstick. With a broken broomstick, you now can wield a formidable spear. A frying pan can make a great blunt weapon. If you have close access to one, sling any contents at the attacker and then swing away. The weight on larger pans can make them clunky, awkward, and can throw you off balance if you swing too hard, so be aware of your limitations. Your living room, family room, or den is your haven and hub for your family. It is probably filled with furniture, maybe a TV, and lots of memories. 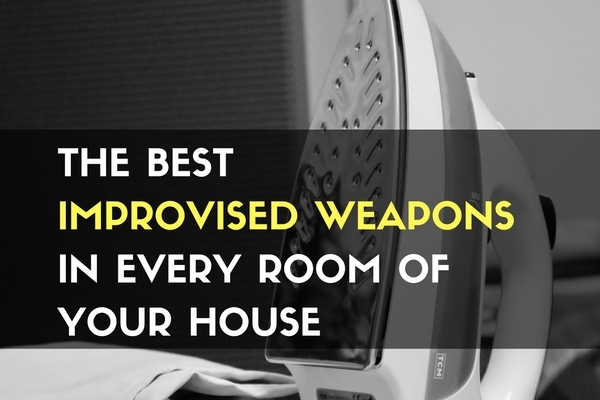 Here are a few ideas for makeshift weapons if you are ever confronted in your living room. The tools in front of traditional fireplaces usually include a poker, brush, shovel, and log tool. The poker and the shovel make for good weapon options, but all are great self defense tools with their sturdiness, weight, and reach. The stand itself can also be used to fend off an attacker. Have you ever seen a lion tamer with a chair? That is the effect we would be going for when using furniture for self defense. Turn the chair or stool so the legs create a diamond, rather than a square. This will keep the attacker from being able to squeeze between the legs and get to your hand hold position. Using furniture usually limits you to a defensive position due to the bulk of the furniture, unless you charge with it. Charging in hallways or small rooms can be especially effective if you meet them with a chair in hand. If an intruder was looking for an encounter, this is probably where they would like to find you. You are probably at your most vulnerable in the bathroom. 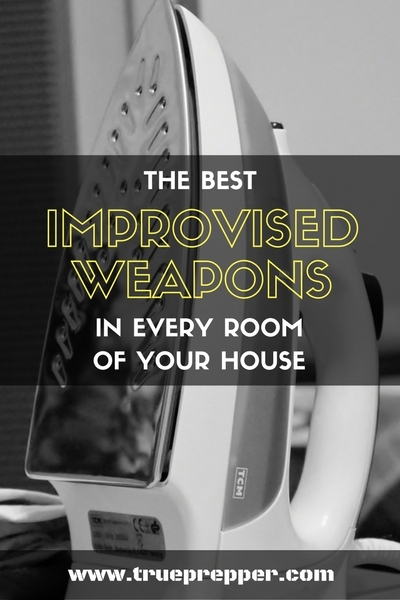 There are limited options for improvised weapons in the bathroom, but here are a few of the better ones. The shower curtain rod is accessible while taking a shower and gives you great reach. Remove the curtain and any rubber stoppers from the ends to make it more effective. A plunger may seem like an odd choice for a weapon, but unscrew the rubber bulb from the end and you basically have a two foot baton. Quick strikes are best with a baton- think fishing pole rather than baseball bat. For the best results, aim for the head, neck, arms, and legs. Laundry rooms are typically small and do not have much to offer in the way of makeshift weapons. The best you can find are pretty intuitive. A clothes iron can pack a heavy punch. Although they are made much lighter than they were 50 years ago, they still can do damage. Be sure to grip the iron tight to keep it from swinging into your wrist on impact. Also, keep the cord under control. While an ironing board is long and wide, it is a useful tool to keep attackers at bay. Open or closed, the board is bulky and strong enough to stave off an attacker easily. You can also use it to slow down an attacker if they are chasing or pursuing you just by opening it in a hallway or other small room. While it is unlikely to meet an intruder in your garage, it would also be quite unfortunate for the invader. Garages, carports, and sheds house all sorts of equipment that can double as a makeshift weapon. Wasp spray has an amazing 20 foot reach. Aim for the eyes to incapacitate any intruder quickly. You may want to pass over this if they have glasses on, since that will reduce effectiveness. Otherwise, this gives you a large reach to instantly down an attacker with little risk to yourself. Baseball bats, golf clubs, hockey sticks, hiking sticks, ski poles- the list is nearly endless of useful sporting equipment that can be used as an improvised weapon. Reach and sturdiness are the most important factors when selecting which to use. You want to be able to keep your attacker at bay to minimize your own risk and not have the equipment break on you. Like the many poles found inside the house, these are great for keeping attackers at bay. Whether it is a rake, tree pruner, broom, or shovel; they can all be used as a long improvised weapon. Hammers, crowbars, pruning shears, and large wrenches are the tools of the trade for the horror movie genre for a reason. This makes these tools doubly effective knowing the intimidation factor associated with them. Holding a large hammer overhead with the prying end exposed should make any intruder think twice. Combine that with a loud, firm command to leave and they should be booking it to an exit. While knowing what to use in a pinch if you are confronted is great, being prepared for that situation is the best plan. Learning your risk for a home invasion is the first step, preventing them is the second, and setting up defenses against them is third. Learning your risk only takes a few minutes online, preventing takes a little risk analysis, and planning defense is easy once the first two steps are accomplished. Keep exploring, stay prepared, and stay safe. Great post, really enjoyed it. In most home invasions you don’t have enough time to get a proper weapon so you’ll need to improvise and you’ve make some great suggestions. One suggestion I’d make is to use your keys as well. Sometimes you could be heading to or from your car and could be attacked. If you have your key ring in your your clenched fist and have the biggest key protruding from your fist (in between your fingers like a spike), you’ve got a pretty good weapon. Don’t forget about flashlights. I keep a number of the MagLite flashlights that use D sized batteries scattered around the house both for light during an unexpected power outage AND as a club if needed. Easy to hold close to the light source since the switch is up there, and doing that places your grip perfectly to club an intruder. Thanks for covering an important topic!